February 15, 2018 – The United States Mint (Mint) has opened sales for the 2018 Preamble to the Declaration of Independence Platinum Proof Coin. This coin is the first release in the three-year (2018-2020) Preamble to the Declaration of Independence Platinum Proof Coin Series. 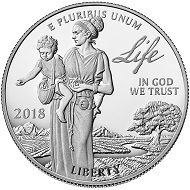 The series features all new obverse (heads) designs, as well as a new common reverse (tails) design on a one ounce, 99.95 percent platinum proof coin each year. United States / 100 USD / Platinum .9995 / 1 oz / Design: Justin Kunz and Phebe Hemphill (obverse); Patricia Lucas-Morris and Don Everhart (reverse). As with all Mint products containing a precious metal, this coin will be priced according to the range in which it appears on the Pricing of Numismatic Gold, Commemorative Gold, and Platinum Products table. Current pricing information is available online. Orders will be accepted online. Information on shipping options is available here. Additional information about the Preamble to the Declaration of Independence Platinum Proof Coin Series is available here. For information about the United States Mint, please visit its website.